Massachusetts Institute of Technology introduces their newest version of robo-cheetah after its first version developed by Boston Dynamics was publicly shown in 2012 with the maximum speed of 18mph while connected with the lab cables. The new version can now run on its own outside the laboratory. According to Sangbae Kim, Associate Professor of MIT, they aim to understand the aspect of the locomotion of animals focusing on four legged animals and to study how they run with their legs in the field and natural environment. They would like to take the study as an inspiration in the engineering aspects that they may develop prosthetic legs or a new way of transportation. Hae-Won Park, Reseach Scientist and Mechanical Engineer of MIT, shares his fascination of the world’s fastest four legged animal, the cheetah and would like to make their robot as fast as the real one. With the help of research, they studied the motions of the real cheetah and applied the principles to their robot. Currently the MIT cheetah can run up to 10 mph and jump over 33 centimeters. Kim believes that the previous ways of powering legged robots with internal combustion engine and hydraulic transmissions makes the robot noisy and inefficient. He would like to prove that those are not the only ways to power a robot contrary to others’ belief. The robo-cheetah shows that electric powered robots can run and jump. They developed all the aspects of the robot, including motors and control system. Kim further shared his excitement as they present robo-cheetah that is efficient, quiet and powerful. 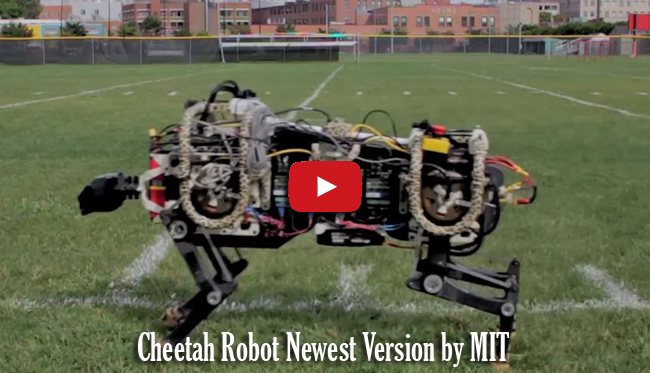 The MIT robo-cheetah’s video had been posted in MIT’s official YouTube account entitled ‘MIT Robotic Cheetah’ on September 15. The video already garnered more than 1.5 million views in just 3 days.